The recovery of viable cells from Arctic and Antarctic permafrost samples is generally facilitated by using nutrient-poor media (Gilichinsky et al. 1989; Bai et al. 2006; Steven et al. 2007a), suggesting that permafrost communities are primarily oligotrophia although organic carbon is more abundant in Arctic permafrost (Vishnivetskaya et al. 2000; Gilichinsky 2002a; Steven et al. 2006). Microbial abundance and activity in subsurface soils is affected by soil porosity, as subsurface pores are required for the movement of liquid water, with larger pore sizes associated with an increased availability of organic compounds (Kaiser and Bollag 1990). The sequestering of liquid water as ice in permafrost reduces porosity and may therefore act to limit the availability of organic carbon, selecting for oligotrophic microbial populations. Permafrost microorganisms also tend to be more halotolerant than organisms from the overlying active layer soil (Gilichinsky 2002a; Steven et al. 2008a). Microbial survival in extremely cold environments is under the influence of ice formation and, consequently, little biologically available liquid water is present. Therefore, water activity is probably an important factor influencing microbial survival in permafrost (Gunde-Cimerman et al. 2003). In addition, during freezing and the binding of water in ice crystals, ions are expelled and concentrate in the remaining liquid phase (Price 2007). Thus, there may be a connection between halotoler-ance and microbial survival at extremely low temperatures. Permafrost microorganisms are primarily cold-adapted, with very few mes-ophilic or thermophilic isolates identified (Gilichinsky 2002a; Steven et al. 2006) Most isolates described are psychrotolerant (growth optimum >20°C) rather than psychrophilic, although both psychrotolerant and psychrophilic microorganisms capable of growth at subzero temperatures are isolated from permafrost (Ponder et al. 2005; Bai et al. 2006; Steven et al. 2007a, 2008a), suggesting the potential for growth and metabolism at the ambient subzero temperatures in permafrost. 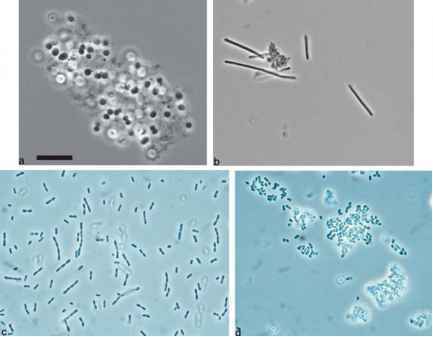 Many of the microorganisms isolated from permafrost represent potentially novel microbial species or genera (Bakermans et al. 2003; Bai et al. 2006; Ponder et al. 2005; Rivkina et al. 2007; Steven et al. 2007a, 2008a, b). Recent genomic (see Chap. 11) and proteomic (Qiu et al. 2006; Bakermans et al. 2007; see Chap. 12) investigations of species from the genera Exiguobacterium and Psychrobacter will help define the physiological and genetic adaptations that have allowed these organisms to survive in permafrost. Presumably, these and future studies will lead to a better understanding of long-term survival at subzero temperatures and the low temperature limits for microbial growth and metabolism.